DIYI (Do-it-yourself-invitations.com) Ezine is a bi-monthly newsletter to keep you up to date with the latest happenings on our site, as well as any upcoming contests, giveaways, or announcements. 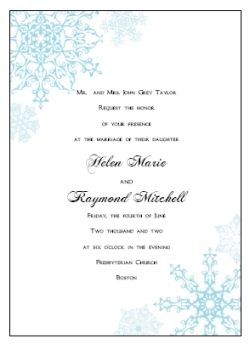 Introducing our newest of printable invitation templates, the Snowflake Wedding Invitation Template. This template comes in two colors - either the blue as shown or grey. We are now offering two template sets as well. The economy set comes with a matching RSVP and Thank You card, or you can choose the Deluxe Wedding Suite with Invitation, STD, RSVP, reception cards, menu cards, enclosure cards, table and place cards, programs, water and wine bottle labels, favor tags, and Thank You cards. Just 7 more days left to submit your entry into our contest and giveaway. Submissions will be accepted until December 15th at midnight! 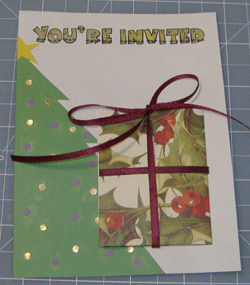 Don't have an invitation to enter? No problem! You can still enter our giveaway by spreading the word. Link to our contest from your blog, website, or on your favorite message boards or social media for an entry to the giveaway. 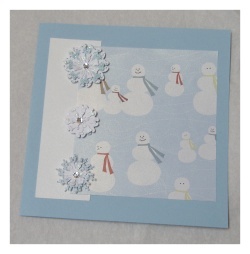 Second Place (Runner Up) - A $75.00 Gift Card to Scrapbook.com: Thousands of scrapbooking and card making supplies. HUGE daily discounts! Yes we will be hosting another giveaway as part of this contest. 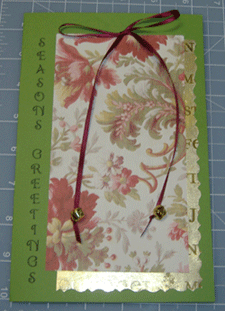 All handmade invitation entries will also be automatically entered into the random drawing giveaway. Contestants can gain additional entries by posting about our contest on their blog, website, or favorite message board. So what is the prize? you may ask... A huge treasure box chalk full of card making and craft supplies!